I have found that the less preamble before a meal the better. If you set someone up for something new and wonderful for dinner, some recipients can become suspicious and mentally prepare themselves for something scary. You know who they…..or possibly you are. For instance, it is more effective to say ‘Ha! There was no dairy at all in that mac and cheese that you just said you loved!’ (you can word this more maturely if that’s your style) than ‘You are going to loooove this mac and cheese, you can’t even tell it’s dairy-free’. Even if you are cooking food for adults, in my experience, unless they are your fellow nerdy nutritionist friends or vegetable-appreciating sisters, it is usually better to be sneaky. 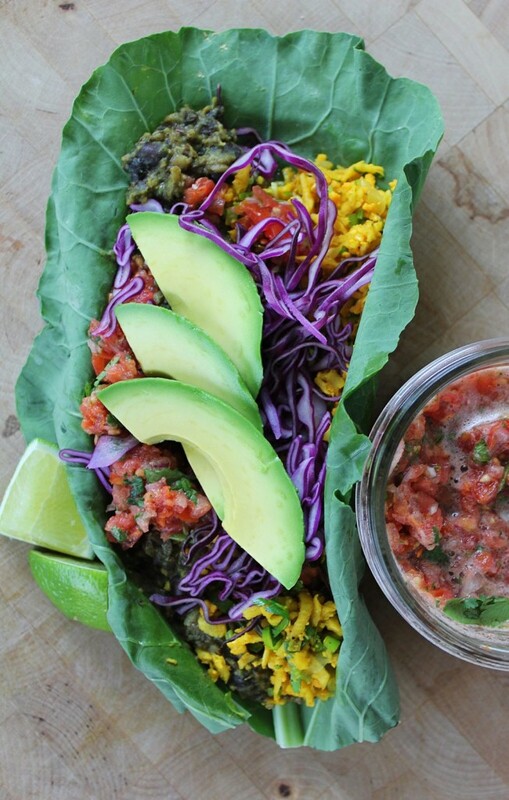 We can keep the cauliflower part of this cauliflower ‘rice’ on the down low. It doesn’t taste exactly like rice, but it is not too far off, and most importantly, it tastes awesome. This isn’t just an example of adding more veg to a dish, it is an example of being all veggies, those things we need to eat more of. It is basically salad, complete with cancer-fighting powers (thanks I3C c/o our fave cruciferous veg, cauliflower) and a nice and low glycemic index (cancer cells far prefer high gi treats). The perfect accompaniment to this cauliflower rice is refried black beans. No sneaky tricks here (except for an extremely loose use of the word ‘fried’), just major anthocyanins thanks to the black beans deep black-y purple hue, support for the colon and a good amount of protein. Ok, maybe there are a couple of well-meaning tricks (isn’t that why I’m here?) including a dose of turmeric (it gets along well with the other spices and its life goal, besides yellowing the universe, is to stomp on cancer cells) and the kombu that you cook with your soaked beans to improve digestion….forget about removing from the pot before purée-ing the beans…and then realize it you don’t notice the taste, so you continue to do it every time. Again, shhhhhh, no one needs to know, but their thyroid glands are going to be butterfly-wing thumbs upping you across the dinner table. 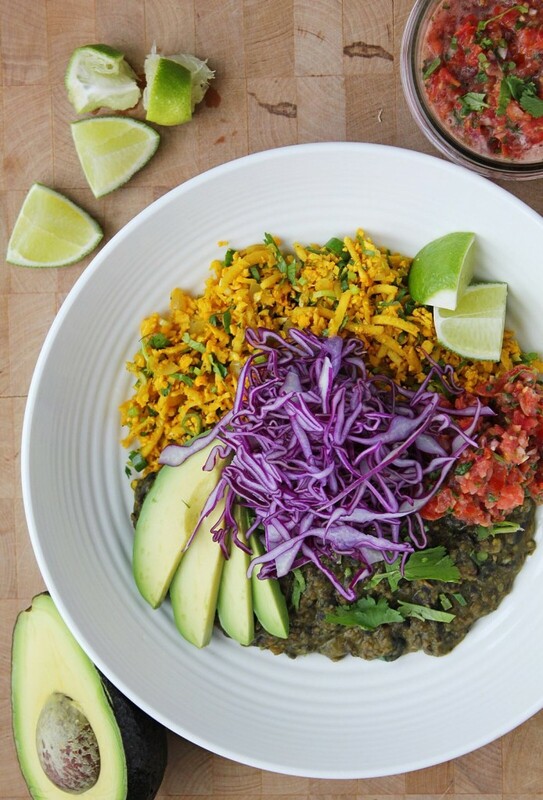 I included an extra recipe this week because it fits in very well, is an easy way to elevate this meal and falls a little bit short of deserving its own post: Lazy salsa. Winter hothouse salsa. 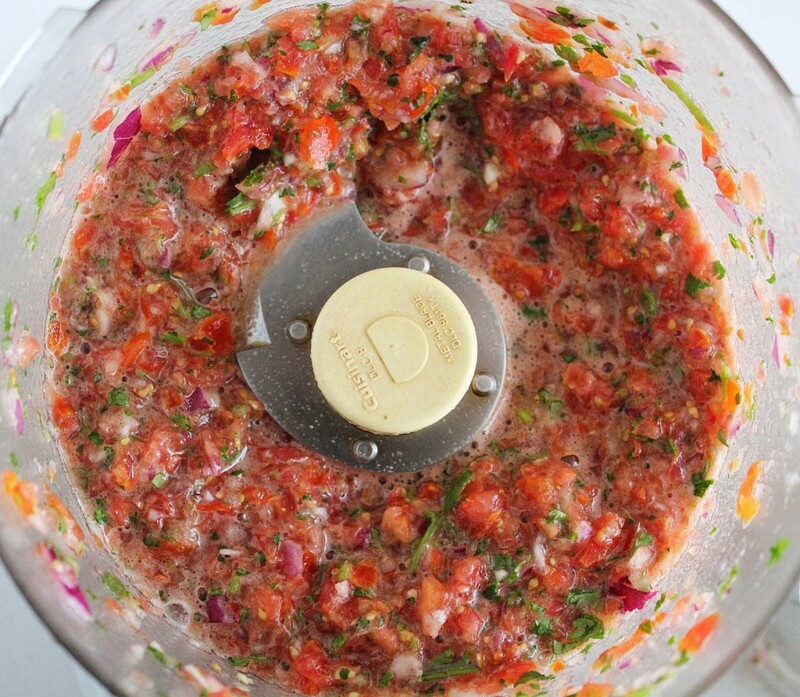 Speedy fresh salsa. It’s really good fresh salsa that can be made any time of year from those little pints of hothouse cherry tomatoes that taste better than big tomatoes this time of year. Yes, it is a good idea to eat seasonally as much as possible, but once in a while we need some fresh salsa. 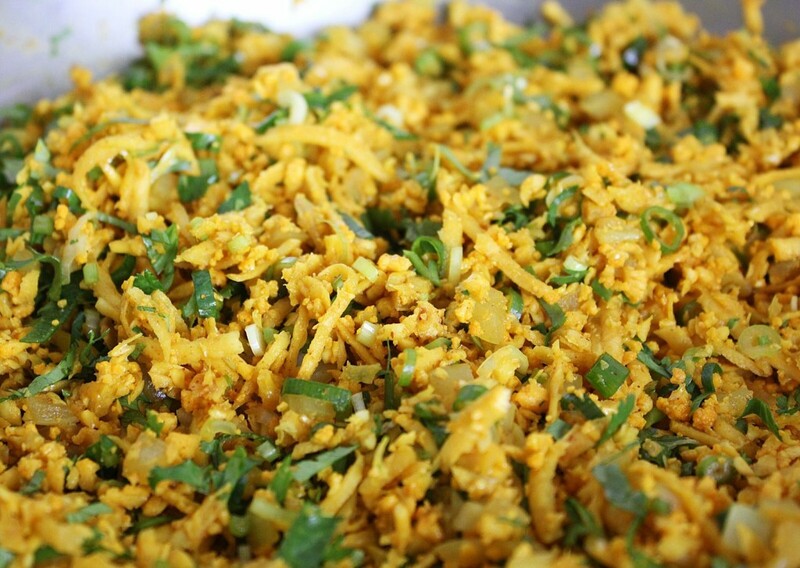 This version is fast and easy to make, you need a food processor or blender and 30 seconds. I used to ‘concassé’ my tomatoes, peeling and seeding them (removing so much of their vitamin C and many minutes of my time from my life that I will never get back) now this is as fancy as I get. Try this with in-season tomatoes (full-sized or littles) and be prepared for a good time. I love it raw, but you can also cook it down a little bit in a saucepan if raw onion and garlic do strange things to you –this will also up the lycopene content. 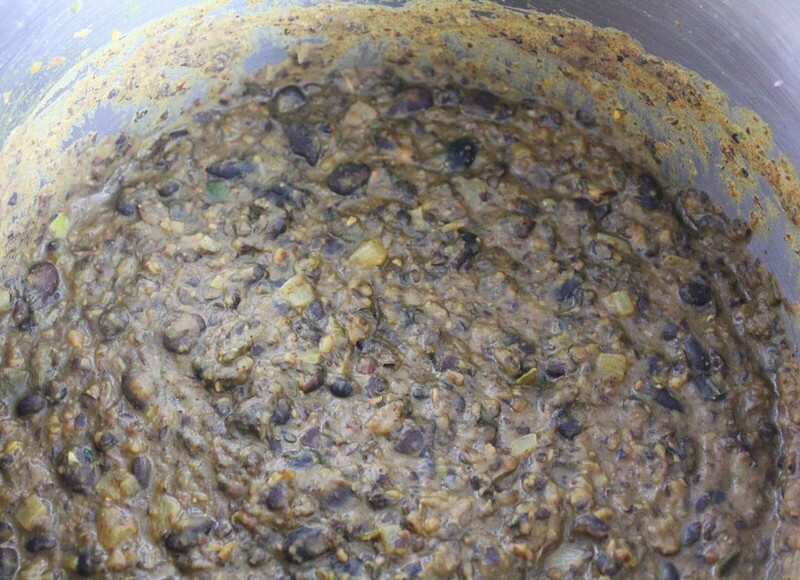 This secretly cauliflower rice squished up against these secretly seaweed-y and bright yellow black beans and some of the easiest fresh salsa of all time are going to taste so good together that no one is going to be asking any questions. 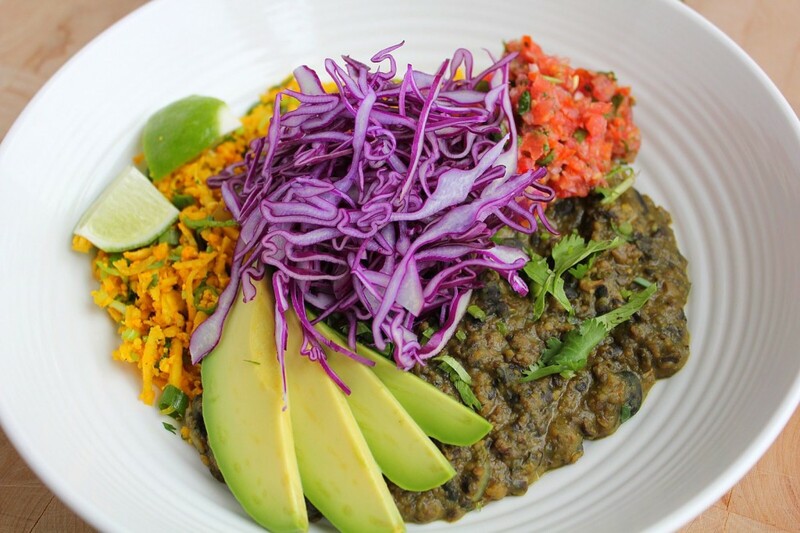 Try it all in a bowl or wrapped up in a collard green, topped with sliced avocado or guacamole, shaved cabbage and fresh cilantro. Just think about how many veggies that is! In a pot, on medium heat, sauté the onion, leek and garlic in the coconut oil and a splash of water. After a few minutes, once softened, add the turmeric, cumin and chili powder and continue to sauté for another minute or so. 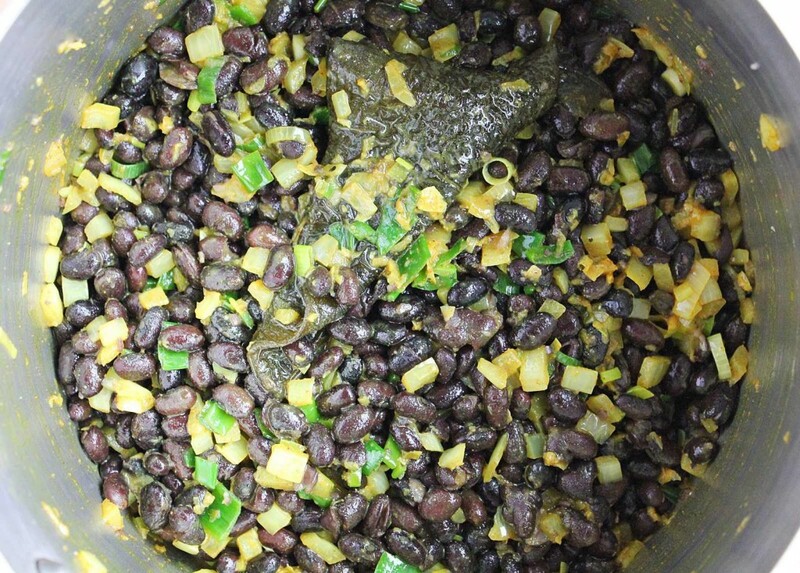 Add the cooked beans and ½ c of water and bring to a simmer. Allow to slowly simmer and reduce for a few minutes. With an immersion (stick) blender, carefully blend the beans roughly to break them up and create a chunky purée (add more water if needed). If you want to be extra cautious, wait for everything to cool down before doing this step. Alternatively, blend ⅔ of the beans in a blender or food processor and return to the pot to mix with the ones you left whole. If too watery, leave them in the pot on med/low heat and stir them once in a while as the water evaporates. If too thick, add a little bit of water at a time until they reach the right consistency. 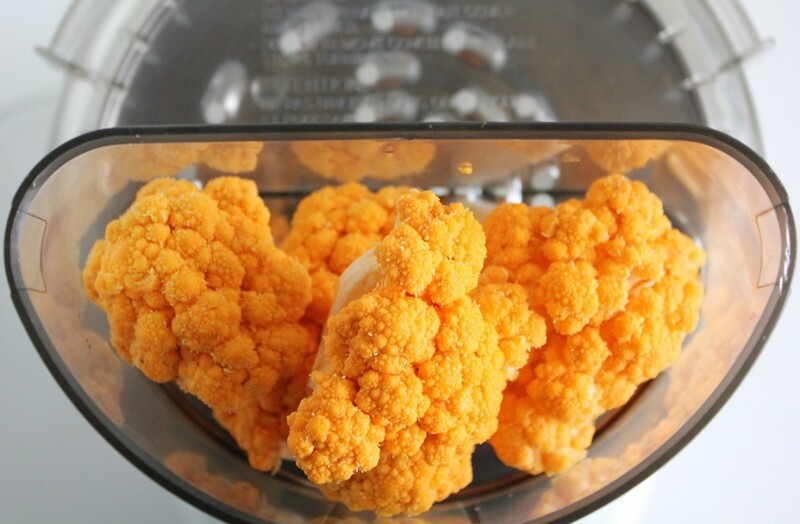 Grate the cauliflower either by hand or using a food processor attachment. In a sauté pan, on medium heat, sauté the diced onion and garlic in the coconut oil and a splash of water until they have softened. Add the grated cauliflower and ¼c water, stir it around and then put a lid on top and allow the cauliflower to steam for a minute (careful that there is moisture left in the pan so that the bottom doesn't scorch -add water as needed). Remove the lid and continue to sauté, allowing the rest of the moisture to evaporate. 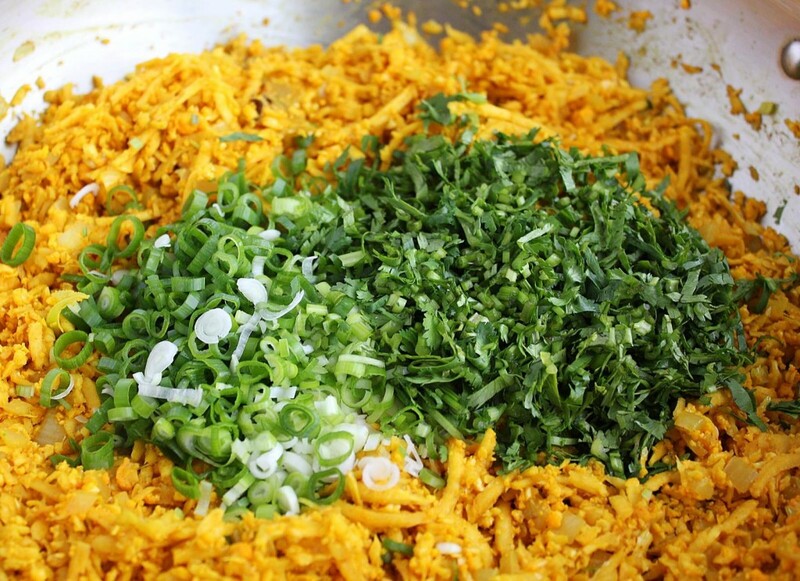 Remove from heat and add the cilantro and green onion. Adjust seasoning (salt and pepper) and add a squeeze of lime juice. 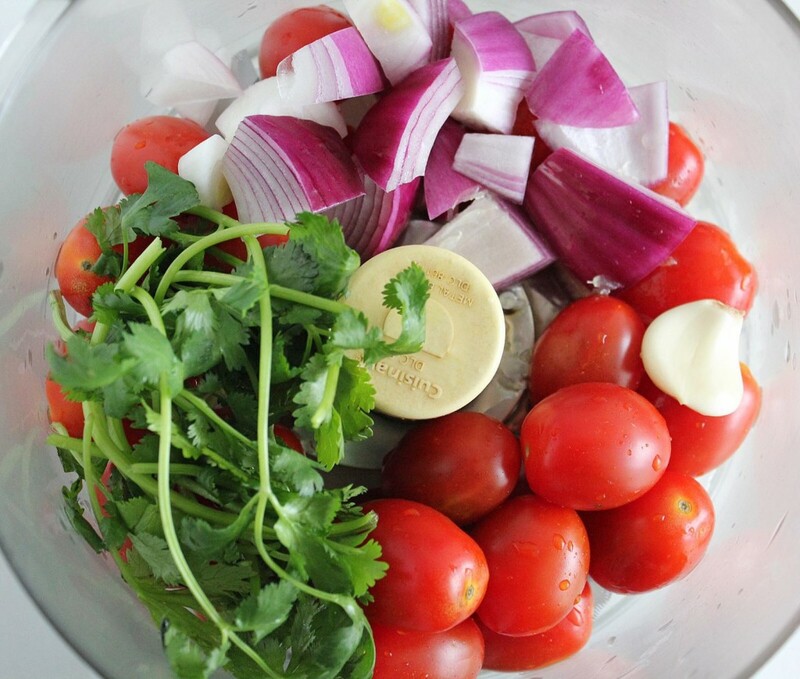 In a food processor, put everything but the cilantro and pulse until chunky/smooth (see picture). Add the cilantro and pulse a few more times. Keeps for 4-5 days in the fridge. Just made the cauliflower rice tonight.